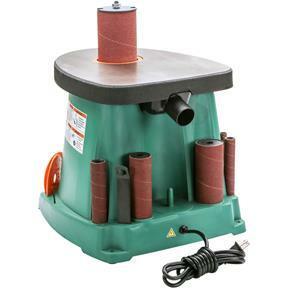 Don't let the compact size fool you, this Oscillating Spindle Sander with cast-iron table will handle just about any job you throw at it. With six different diameters of sanding drums, sanding curves of all shapes and sizes is never a problem. Onboard storage keeps sanding spindles, sleeves, table inserts and spindle washers organized and handy. This is truly a great benchtop machine! CSA certified meeting CSA C22.2 #71.2-10 and UL 987-7 standards! 5 rubber sanding drums: 3/4", 1", 1-1/2", 2", 3"
6 sanding sleeves: 1/2", 3/4", 1", 1-1/2", 2", 3"
6 table inserts: 1/2", 3/4", 1", 1-1/2", 2", 3"
3 spindle washers: 5/8", 7/8", 1-3/4"
This is my first oscillating spindle sander. Purchased for specific project to sand curved parts of a project. Has plenty of power, very little vibration, easy drum changes. Only thing that could be added is a hook, post or something to store the spindle washers, all other items have a storage position. The sander is a replacement for a Ryobi that I had for many years. Grizzly's version is exactly what I need. Got this for doing more delicate work! Runs fine, not too noisy and works well for my needs. Its also light enough to move around if needed, good product. Christmas present for my husband and he really likes it! I recently purchased this product to help with curves on some of my scroll saw projects. It has also become useful for other projects as well. So far it has performed like I would expect a product from Grizzly to perform-excellent!! Great product. It is very efficient and less noisy than another brand I used in the past. It is very easy to change grits and sizes and also the dust easy very controlled. I would definitely recommend this product. High quality, Good, solid machine. Good value for the money. I was fighting with drum sanders in a hand drill then on a drill press when I finally bought this unit. Works amazing well and efficiently. I got it for Christmas and love it! There's plenty of power to do what you want to do. My husband desired this item for Christmas and so far has been delighted with how easy it was to setup. Been putting off buying a spindle sander for years, finally got this Grizzly model & cant be more satisfied! This machine is so simple to use and performs great, just hook the shopvac up to the back and go. 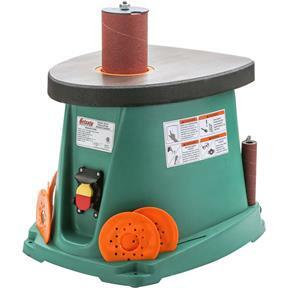 I bought the G0739 oscillating spindle sander it works great so far .I have had just over a mouth it works better than I expected I would recommend the sander.I miss going to store in Pennsivina to check out the tools in person and talking with staff. This was dilivered as expected Grizzly packed it very well. This is a well built sander works great! Great job Grizzly! keep making great products. The spindle sander works very well. I purchased it mainly to sand inside curves and for precise pattern making. It arrived in just a few days and was easy to assemble. The was my second purchase from Grizzly and I am sure it will not be my last. I would recommend this sander to anyone. It is well built, has good dust collection, sold for a fair price, and was delivered quickly. No problems yet. I received the sander in a timely manner and it has worked perfect for what I wanted it to do. The price and the metal work area is great too. I would highly recommend this item. Bought this back in March. Still haven't had much call to use it as I've had other things going on. From the little I have used it, the machine still lacks the power I need in the shop. This purchase was just to temporarily fill in until I can afford to get a commercial stationery unit. I think everybody's least favorite part of woodworking is sanding. 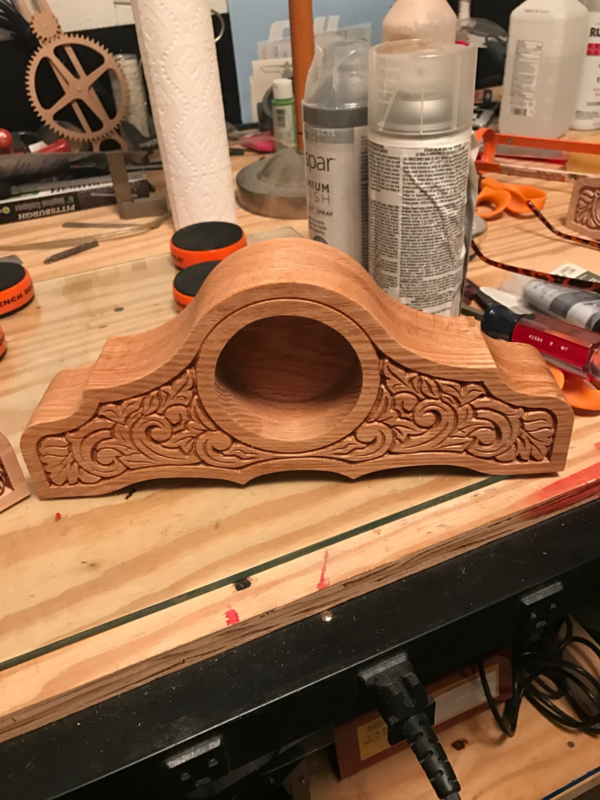 I was tired of sanding all of the curves on clocks that I am making. This sander has made that so much easier. It's a very smooth running machine. I do a lot of woodworking but this is the first oscillating sander I've ever used. This does a great job. for any piece I'm working on. I bought this to sand profiles on my work pieces, and it works great. Very good sander, has lots of power ! Like thw fact that a 3 inch spindle comes with. I bought this sander about a month ago, the sander works great. Nothing I can say bad about it. The one thing that I would say is, there is on board storage for everything except the small washers for the different spindles. What would be nice is a small closable box in the base to put the washers in so they don't get lost. This sander works great and does everything that I need it to do. Saves a lot of time over hand sanding. 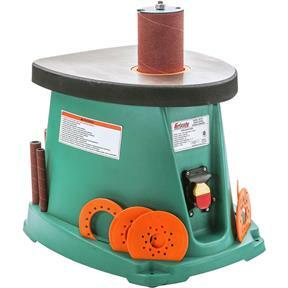 ordered the spindle shaper because it fit the needs of my shop , small portable and capable of doing what we needed . I have not used it on a project yet, but I did some preliminary samples and it worked just fine. I purchased this unit about a month ago and am very pleased with my purchase. I have been purchasing Grizzly tools for many years and for the most part I find them very satisfactory. I bought this a mounts ago I have used it on many projects sense then and wish that I purchased this a long time ago. Great tool! I bought this for my dad for christmas. He just retired teaching, 20 years of his 32 years was a jr high/ high school woodshop teacher. He ran all Grizzly power tools. The tools took a beating from the kids, use and school maintenance projects and they always held up. The only tool my dad didn&#39;t have in his personal shop was a spindle sander and when I saw this one I didn&#39;t have to look at another one. He has used it on hardwoods, large and small projects and it works great! I bought this as a Christmas gift but my husband has been using your products for years and has this same model and we have always depending on your products when it counts on the job. You have a great product line! The machine is good and fits my need, however the equipment was lost by UPS and had to be shipped a second time. Grizzly did their work well. This sander is outstanding sander in all respects powerful easy to use durable at a fair price. Purchased it a few months ago and have had great success. This seems to be the best one out on the market. I would recommend it to anyone that wants a good piece of machinery but dosnt want to break the budget. It has an area for all the attachments, setup and functions are easy, right out of the box. Very efficient, a huge step above using my drill press to do this task. Having a dedicated machine has certainly increased my productivity. What little bit I've used it I really like it. It makes sanding much nicer. Well built product. Set up was very easy and in less than five minutes I was sanding. Vibration free - I didn't even secure to table and it sat in place through first use. Of course if you have place to secure it - that is best. I sanded some one inch thick oak with several reverse curves in it and the machine did not even notice I was sanding. Solid and well built with plenty of power, yet at 30 some pounds I can move it around with little trouble if need be. I have no regrets about this purchase. amazing sander. easy to set up and use. no complaints about this machine.